Today, Narcotics Anonymous is well established throughout much of the Americas, Western Europe, Australia, and New Zealand. Newly formed groups and NA communities are now scattered throughout the Indian subcontinent, Africa, East Asia, the Middle East, and Eastern Europe. Narcotics Anonymous books and information pamphlets are currently available in 41 languages. Membership Survey : Contains the results of a biennial survey of approximately 17,492 NA members. Information about NA : Includes facts about the history of NA, organizational philosophy, and membership demographics. NA: A Resource in Your Community : This pamphlet provides information about local NA services that may be available such as public service announcements, phonelines, literature sales, and NA presentations for health fairs, schools and professional conferences. In Times of Illness : This relied-upon booklet was recently revised to reflect members’ experiences with challenges such as mental health issues, chronic illness and pain, and supporting members with illnesses. It includes section summaries in the table of contents. For Those in Treatment : In this pamphlet, we offer some suggestions and a basic plan of action to help recovering addicts in the transition from treatment, to continuing recovery in Narcotics Anonymous. Behind the Walls: This simple booklet, written by addicts recovering in Narcotics Anonymous, is designed specifically for individuals who are currently incarcerated and who may have a drug problem. The following pages are reflective of the experience of recovery, both in and out of institutions, from the disease of addiction. By Young Addicts, For Young Addicts : This pamphlet was developed by young members of Narcotics Anonymous to illustrate the fact that young addicts around the world, speaking many different languages, are getting and staying clean in NA. 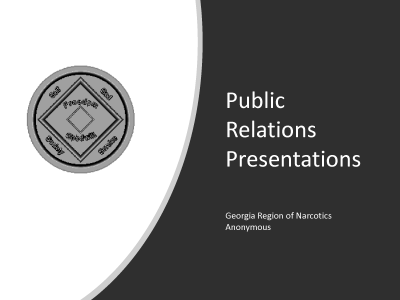 For the Parents or Guardians of Young People in NA : This pamphlet seeks to address some of the questions parents or caregivers may have when a young person comes to Narcotics Anonymous.